Book Review: Sweet Book for Grandmas and their grandkids. 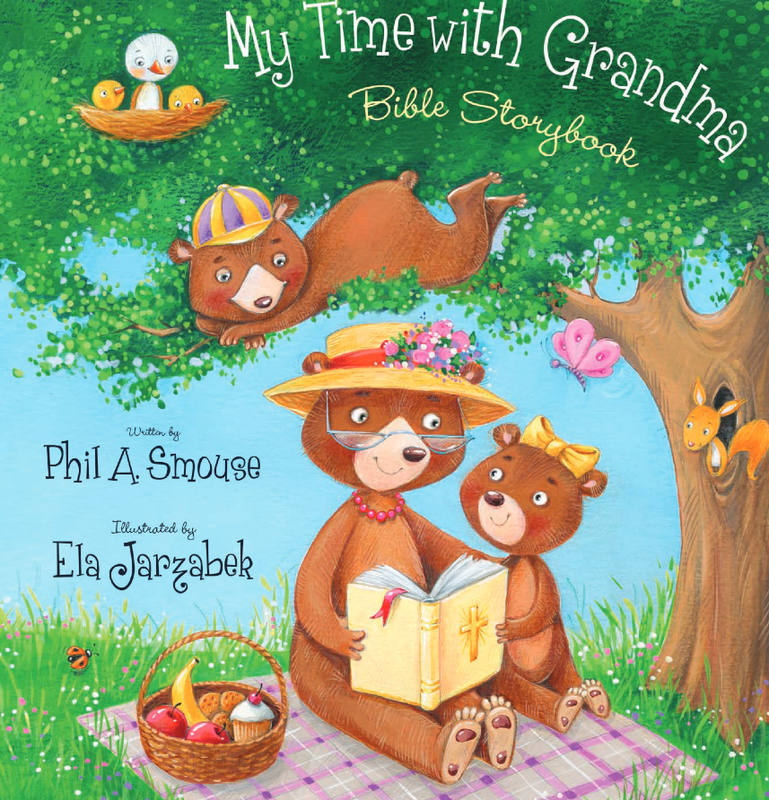 A recent release from Tyndale Kids, My Time with Grandma Bible Storybook introduces a new concept for Bible Storybooks. If you're a grandma with grand kids or know someone who is, this is designed for you. The author, Phil A. Smouse, takes the major Bible stories and condenses them down to a few paragraphs. The selection of Bible stories are great, the stories are easy to read (either by grandma or the grandchild), however I felt like Smouse oversimplified some of the stories so they would fit on one side of the 2-page spread. The illustrations are beautiful. The colors are bright and attractive, especially for small children. Though I recognize this book is written as a storybook for grandmothers, there is no room for movement. It is clear on each page that this book is only for grandmothers. Each story contains a "Note from Grandma." While this adds a layer of "cuteness" for grandmothers, it has the potential to limit the audience. It seems to me that with a little more creative wording, this book could have been used by a broader audience: child care providers, foster families, etc. Overall, I think this book would make a great gift for a grandmother and her grandchildren. I don't think you can ever go wrong when an adult is communicating the truth of God's word to a child. **In compliance with the Federal Trade Commission, I must let you know that I received a complimentary copy of this book in exchange for a book review. I am not obligated to give the book a positive review. Wait...So it's NOT all about me? We are told to make our attitudes the same as that of Jesus Christ. So what did he do? He did not consider equality with God as something to be used for His own advantage. He emptied himself by assuming the form of a servant. He became obedient to the point of death. This is an example for us to follow. We are to serve. We are to be obedient. We are to put others first. We are to do whatever it takes to keep the unity in our church. These are easy things to write down, but challenging to put into daily practice. 1. Describe someone in the church that best fits the description of having the mind of Christ and servant attitude. 2. Go verse by verse through Philippians 2:5-11. Explain how the attitude of Christ in each verse becomes a pattern for us as church members. 3. How would you describe a servant as it applies to being a member of a church? 1. Worship wars. One or more factions in the church want the music just the way they like it. Any deviation is met with anger and demands for change. The order of service must remain constant. Certain instrumentation is required while others are prohibited. 2. Prolonged minutia meetings. The church spends an inordinate amount of time in different meetings. Most of the meetings deal with the most inconsequential items, while the Great Commission and Great Commandment are rarely the topics of discussion. 3. Facility focus. The church facilities develop iconic status. One of the highest priorities in the church is the protection and preservation of rooms, furniture, and other visible parts of the church’s buildings and grounds. 4. Program driven. Every church has programs even if they don’t admit it. When we start doing a ministry a certain way, it takes on programmatic status. The problem is not with programs. The problem develops when the program becomes an end instead of a means to greater ministry. 5. Inwardly focused budget. A disproportionate share of the budget is used to meet the needs and comforts of the members instead of reaching beyond the walls of the church. 6. Inordinate demands for pastoral care. All church members deserve care and concern, especially in times of need and crisis. Problems develop, however, when church members have unreasonable expectations for even minor matters. Some members expect the pastoral staff to visit them regularly merely because they have membership status. 7. Attitudes of entitlement. This issue could be a catchall for many of the points named here. The overarching attitude is one of demanding and having a sense of deserving special treatment. 8. Greater concern about change than the gospel. Almost any noticeable changes in the church evoke the ire of many; but those same passions are not evident about participating in the work of the gospel to change lives. 9. Anger and hostility. Members are consistently angry. They regularly express hostility toward the church staff and other members. Ever feel like you're heading the right direction, but you can't seem to get there? You feel like you are going where you should, but something doesn't add up or feel right? If you're a parent you've probably been on both sides of the issue. Your child is learning to drive; you offer advice only to be told "I've got this...take it easy!" Your toddler wants a big kid cup for the first time and, as you're trying to show them how to be careful, they spill the chocolate milk all over themselves and the floor. You want to show your supervisor how good you are, ignoring the counsel of others, and fail as a result. As a Christian, when faced with challenges, we try to "fix-it" on our own. We even talk with friends and seek their advice. We take matters into our own hands. Then when everything is crumbling around us, when we can't seem to make any advances forward we throw up our hands in frustration and cry out to God and ask "Why?" It's the age-old question: "Why do we always approach the One who can handle everything as a last resort?" I know I do this all the time. I'm a "fixer." I have a strong feeling you do this too. It never works. Not like it's supposed to. Never. What would it look like for you and I to "submit," "come near," and "humble" ourselves? I think we would find ourselves running into walls over and over again wondering why things aren't working out the way we thought. What "sticks" do you need to give to your Master? **I'm facing a bit of, what writers call, writers block. I'll be posting new Wednesday content soon. Thanks for your patience and understanding. Anytime an organization, especially churches, are in a time of transition there is the potential for both the good and the bad. We can focus on the things that need to be done and the dissenters or we can focus on God’s plan for the church. The good news is that we get to choose what we focus on. Defining the win gives us tangible targets for ministry. Without pursuing ministry on behalf of Christ, the church is nothing more than a stagnant and listless institution that possesses no real value. Seeing wins happen breathes meaningful life and zeal into the congregation that fuels passion and can energize it into an unstoppable movement. At staff meetings, I ask the question, “What happened last week that made you feel like you've made progress in your mission to lead people to become "rooted in God's love?" Basically we are looking for people (individuals and groups) and are showing evidences of becoming “rooted.” As we talk, I write these down. We know there are many things that need to be adjusted or addressed and those things can weigh us down and distract us from seeing God’s hand at work in the lives of those who call Campbellsville Christian Church home. So we celebrate together. I want to let you in on a few highlights of our staff celebrations. · Anita Smith faithfully drives a group of from Jackson Towers to Wal-Mart each month to get groceries. · The High School small group created “kits” to hand out to homeless people as their families travel together. · Spiritual development taking place in the Middle School Boys Small Group. · Lynn and Nancy Farmer and Jennifer Clark giving their time and talents in making a new church directory a reality. · Around 100 people gathered on Dec. 15th to make 70+ blankets for the Crisis Pregnancy Center and the local Hospice agency. · The prayer lives of people are deepening. o Group supported shelters in Taylor, Marion, and Green county. · If you can’t tell yet, much good is happening in the lives of the people of Campbellsville Christian Church. Celebrating not only encourages people to continue to do what is right, but it reflects the biblical principal of joy. When God rested on the seventh day after creation, we do not believe he needed to take a breather; instead he took time to enjoy his creation; to celebrate. Take a look at how many Jewish celebrations and holidays are found in the Bible and you will discover that celebrating the work of God is a core part of worship. So when it comes wins, we should celebrate with our brothers and sisters whether it is through verbal praise, recognition, or throwing an actual party! Do you know of a win? Let us know. Often, my blog posts on Monday’s are devoted to highlighting “wins” from the life of the church. If you’d like to know more about what it means to be “rooted in God’s love,” check out www.rootedingodslove.com and click the “more info” button. REVIEW: Not just another video study. Love Does is a new Small Group DVD study from Thomas Nelson based on the book by the same name. It is subtitled, “Discover a Secretly Incredible Life in an Ordinary World.” When I first saw this I thought "Just what we need! 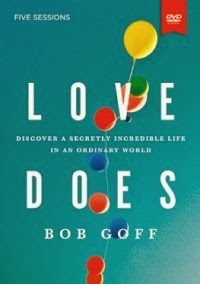 Another group study that over promises and under delivers!” If you’ve never heard of Bob Goff, you are in for a treat! Bob Goff has an infectious personality with a level of honesty and authenticity that makes you want to call him up and invite him to your house because you want whatever it is that he has. Love Does challenges participants to rethink all they thought they knew about love; God’s love and their own love for others. Bob is a master storyteller who can tell true stories that challenge, encourage, and inspire listeners to embrace this life. What makes the study even better is that you cannot leave a session without laughing again and again! This is critical to understanding God’s love for us. God is not some crusty curmudgeon who can barely stand to look at His creation. Bob reminds us that God enjoys us, longs for us to succeed in loving others, desires His absolute best for us. Love Does will make you uncomfortable during this five-session journey, but the process is most certainly worth it. The participant guide is full of hands-on, practical group activities and personal challenges that will help ensure that, if you are willing to do a few things that you wouldn’t normally do (nothing too crazy), you will experience God’s love in a refreshing way and you won’t be able to hold it in. but I'm proud of who Christ is in me!" Did you catch that? It's a slight distinction, but it's a powerful one. We often think about all the things that we do as Christian. We are proud of our accomplishments, our changed attitudes and behaviors, and our good deeds. As you re-read this passage from Ephesians you can see very powerfully where the change comes from. Where is the power? "God...made us alive with Christ." "God raised us up with Christ." "this is not from yourselves, it is the gift of God..." We, too often, place the emphasis of our faith, and the change it's brought about, on ourselves. Look again, where is the "you" in this passage? "dead in your transgressions," "followed the ways of the world," "gratifying the cravings of our flesh." Our life-change without the power of God in Christ leaves us dead. Without hope. However, add the power of God in Christ and EVERYTHING changes. We're alive. We're new creations. We're changed by God to do good works. An unexpected lesson for sure. *This post was originally published January 16th, 2013. 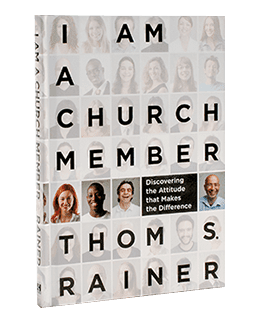 Joel Patton preached the first of a 6-week series entitled "I Am A Church Member," based on a book by the same name from Thom Rainer. If you are interested in reading this book, see me, your local bookstore, or get more info here. 1. 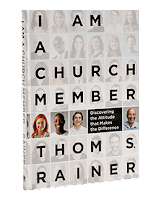 How is the "love chapter" in 1 Corinthians 13 related to church membership (remember, it directly follows Paul's teaching on membership in chapter 12)? 2. Joel said, "The concept of an inactive church member is an oxymoron." The question should never be if you should be serving your church, but to ask yourself and God is prayer is: "How can I best serve my church?" If you are not currently actively serving in the church, are you willing to ask God that question? 3. Joel said (paraphrased), "If you are gifted to do something and are not doing that thing, you are handicapping the church." Where are you gifted and how can you best use those gifts in service to Christ within the church? If you need help assessing where you can best serve, please contact me and I will be happy to discuss opportunities with you. BOOK REVIEW: AHA! : Awakening. Honesty. Action. Ever encounter one of those people and you can’t help but think “Whatever it is they have, I want it!”? There’s something infectious about their personality, they way they live there life with purpose and intentionality. There’s just something different, but you can’t put your finger on it. They’ve had an AHA. 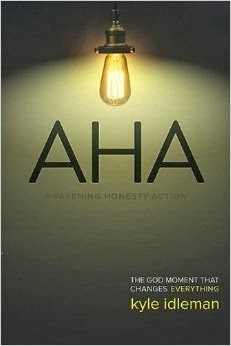 "AHA" beautifully lays out what every person wants to experience, whether they know it or not. We’ve all been somewhere we never intended to be. We've done something we wish we’d never done. We need to experience Awakening, Honesty, and Action. Kyle Idleman unpacks the story of the Prodigal Son from Luke 15 in a fresh and humorous but direct way that cuts to the heart of the matter and offers practical insights and application along the way. I cannot wait until this books is available (March 2014) so that I can recommend this book to the Prodigals and Older brothers in my circles. Disclosure: I received an advance copy of this book to review for free from NetGalley. You can preorder it here.